What a convenient way to eat or drink on your couch! This beautiful natural reclaimed wood-look finished hollow-core accent table has sufficient space for you to place your snacks, drinks and even meals. Its chromed metal base provides sturdy support. A fashionable flair that will suit any dicor. What a convenient way to eat or drink on your couch! This beautiful natural reclaimed wood-look finished hollow-core accent table has sufficient space for you to place your snacks, drinks and even meals. Its chromed metal base provides sturdy support. A fashionable flair that will suit any décor. 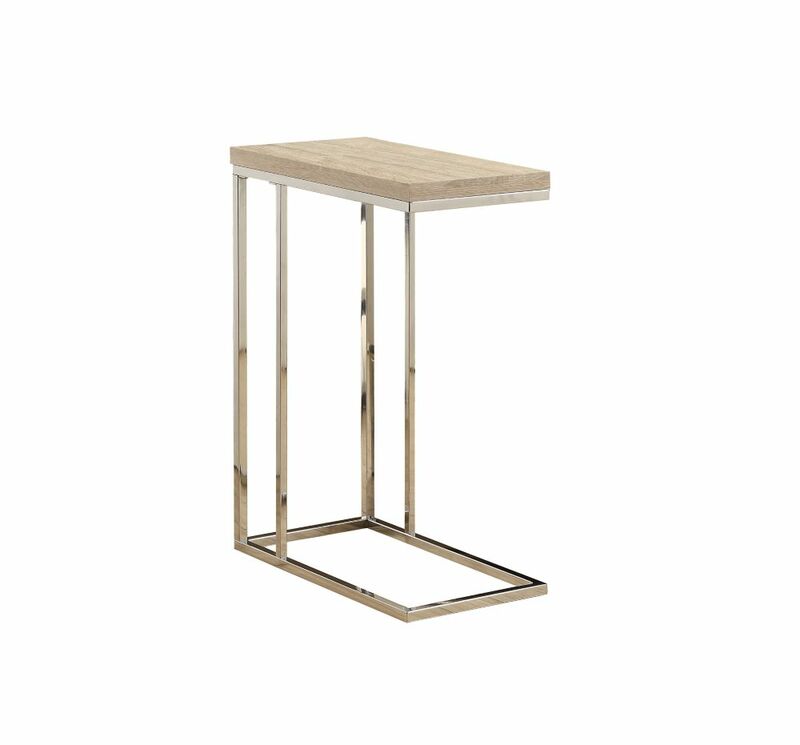 Go sophisticated and bold with the Boden End Table to create a space that is both functional and aesthetically pleasing. With its half glass top, artful chrome legs, and open shelving, this statement piece stores magazines, books, collectibles, and more. Its two-in-one design is a space saver and the perfect accent for your living room, while its clean styling complements any decor. Available in white and oak or white and yellow. Bring minimal style with flair to your home or office with this contemporary console accent table. The thick and spacious rectangular table top in a dark taupe wood look finish is supported by sturdy angular chrome metal legs that keep the space light and airy. Place the table in your hallway or entryway to display your decorative objects, a plant, magazines or in your living room and entertainment area to stage a drinks and food station. With multiple possibilities and a compact size, this stylish accent table will be your most functional furniture piece! Wood-Look Accent Table in Chrome What a convenient way to eat or drink on your couch! This beautiful natural reclaimed wood-look finished hollow-core accent table has sufficient space for you to place your snacks, drinks and even meals. Its chromed metal base provides sturdy support. A fashionable flair that will suit any dicor. Wood-Look Accent Table in Chrome is rated 5.0 out of 5 by 1. Rated 5 out of 5 by brookes from Perfect for my need. This is solid and stable - I am very happy with it.